Intense fragrance, single white flowers fading to lavender-pink. Intense fragrance, love at first scent and sight! 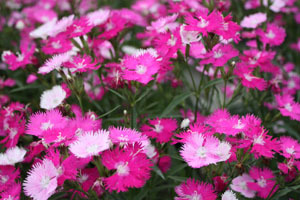 A clump forming hybrid Cheddar Pink noted for the changing colors of its heavily fringed flowers from white to pink to lavender-rose. Blue-green foliage carpets this bloom beautifully. Great cut flower, bring the wonderful scent indoors. Can be used as a ground cover, along paths or in rock gardens.